Heartbreak happens to all of us and can wash over us like the in rushing tide. We are soaked with grief, and the overflow is channeled into the body. Loss becomes a physical emptiness with feelings that often cannot be put into words. The idea of healing can seem so enormous that often we don’t even try for fear of further damage. This leaves an enduring mark upon us and by no means does recognizing that this is not permanent dull its sting for it is the sting itself that stimulates healing. The pain is letting us know that we need to pay attention to our emotional selves, to listen to our feelings and be in them fully. There is a saying that time heals all wounds, and this may be true to some degree. Time tends to dull the pain. Most importantly, open yourself to the possibility of loving, trusting, and believing again. When, someday soon, you emerge from the cushion of your grief, you will see that the universe did not cease to be as you nursed your broken heart. You emerge on the other side of the mending, stronger for all you have experienced. 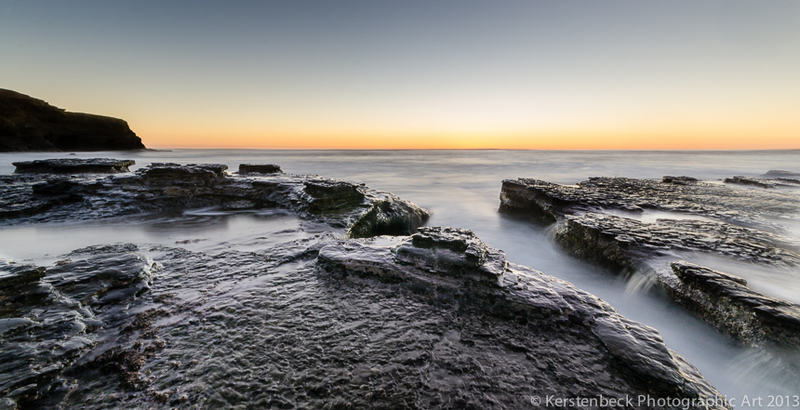 I discovered this fissure in the rock at Sunset Cliff’s in San Diego during a low tide at sunset. It is quite a challenge to get to the beach from the cliffs above, the final descent is down a 30 embankment where a rope has been secured to assist hardy souls getting up and down – a beginners introduction to rappelling of sorts. Having a hefty Manfrotto Tripod and a pack full of photo gear made this even more fun! The waves were quite vigorous this afternoon and this called for a Neutral Density Filter which allowed a 30 second exposure to smooth things out and capture the many tiny waterfalls. I used a Variable ND from Singh-Ray on a 10-20mm lens. Mounting the tripod on a sturdy rock outcrop stabilized the shot with the tide sweeping around its feet (and mine). There are many such geographical features along the coast of Southern California which emerge during the low tide and will be subject of further exploration in the coming years! Please have a look to our website http://www.kerstenbeck.com for more scenic landscapes and other gems which would look amazing framed and on your wall! For better or worse, many people have been raised to believe that communicating in an honest and open way will not get them what they want. They have learned, instead, to play mind games or go on power trips in the service of their own ego. As with all relationships and situations, we must look within for our difficulties and the solution. By disengaging, being still and going within we can begin to see what has hooked us into the mess in the first place. We will likely find unprocessed emotions that can be released into the stillness we find in meditation. The situation will untangle itself and we will slowly break free. Whenever people come into our lives, they have come to show us something about ourselves that we had not been able to see. When unhealthy people try to hook us into their patterns with mind games and power trips, we can remind ourselves that we have something to learn here and that a part of us is calling out for healing. This takes the focus off the troubling individual and puts it back on us, giving us the opportunity to change the situation from the inside out. This was shot recently at The Salton Sea just east of San Diego. The area is beautiful for its desolation – you may recall several other posts with this same Harley and Model. Here we wanted to capture the Ghost Rider zipping off into the distance with the thoughts of two women on his mind, the old and the new. The old, he carries with him as a shadow of what once was, the new still fresh in his mind. To purchase a Digital Download or Print of this unique shot, click http://www.kerstenbeck.com/Things/Things/23228532_wZgQtf#!i=2050290494&k=j7nZKSn and you will go straight to our photo website – you might want to check some of the other Salton Sea pictures while you are there! Stephen Covey, a former Brigham Young University business professor who blended personal self-help and management theory in a massive best-seller, “The 7 Habits of Highly Effective People,” died Monday, July 16th at a hospital in Idaho Falls, Idaho. He was 79. The cause was complications from injuries sustained in a bicycle accident, said Debra Lund, a spokeswoman for the Utah-based FranklinCovey leadership training and consulting company he co-founded. In April, Covey lost control of his bike while riding down a hill in Provo, Utah. He was hospitalized for two months with a head injury, cracked ribs and a partly collapsed lung but “never fully recovered,” Lund said Monday. Covey became a household name when “The 7 Habits of Highly Effective People” was published in 1989. On best-seller lists for four years, it has sold in excess of 20 million copies in 40 languages and spawned a multimillion-dollar business empire that markets audiotapes, training seminars and organizing aids aimed at improving personal productivity and professional success. I have had the privilege of attending one of his seminars – a truly inspirational awakening. His message is a philosophy for living – he will be missed and his message lives on in the hearts and minds of all who have taken to time to listen and learn! Whenever we lose something or somebody we love, it is important for us to take time out for ourselves and truly feel the weight of what we are experiencing. Although it may seem that doing so will push us into a deeper state of sadness, truly giving ourselves permission to be with whatever arises actually creates space for us to begin the healing process. This is because the act of grieving is a natural process, allowing us to sort through the range of emotions that are present in our everyday existence. Even though it may sometimes seem easier to involve ourselves in activities that take our minds off of our sadness, this will only make the route to healing more difficult. Unless we listen to where we are in the moment, the emotions we experience will only grow in intensity, and our feelings will manifest themselves in more powerful and less comfortable ways. Once we consciously acknowledge that these emotions are present, however, we are more able to soothe the sorrow of the moment. When we allow ourselves to accept and deal with our loss fully, we will then be able to continue our life’s journey with a much more positive and accepting outlook. This will make it easier for us to see that our grief is ephemeral and, just like our moments of happiness, it will also come to pass. 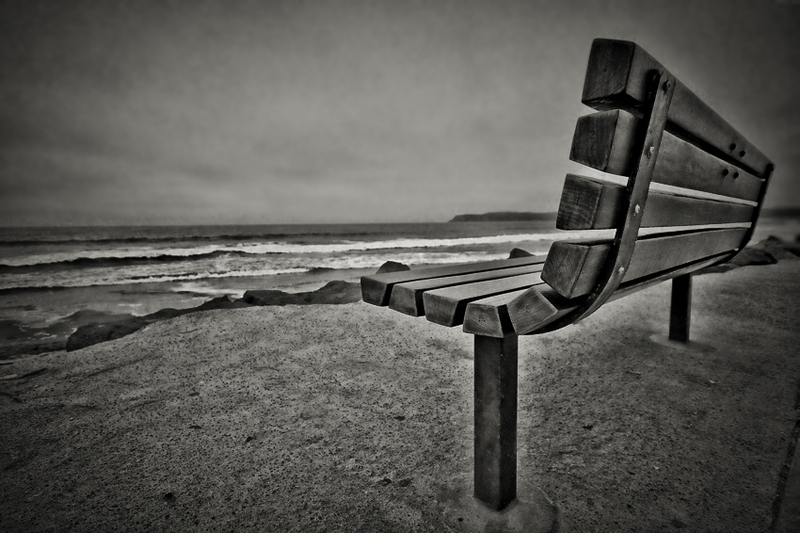 Somehow this lone bench, overlooking the Pacific Ocean in Coronado seemed appropriate. Some SPHINXOLOGY to start: Along with the Great Pyramid of Giza, the Sphinx is one of the greatest enigmas and the most studied ancient monument of mankind’s history. The whole complex of Giza, composed of the Sphinx, the Great Pyramid, other pyramids, and distinct structures, definitely holds the key to understanding advanced past civilizations. There is no other place teeming with so many researchers looking into the mysteries of mankind’s past, which may cause history to be rewritten. Now there are basically two schools of thoughts concerning the origin, age, and the builder of the Sphinx in Egypt. The Egyptologists believe that Pharaoh Khafre built the Sphinx around 2500 B.C., which is about the 4th dynasty. This theory makes the Sphinx about 5,000 years old according to Dr. Zahi Hawass, Director of Giza Saqqara of the Egyptian Antiquities Organization. Now the other school of thought does not believe that the Egyptians built the Sphinx, but think that it was built by an advanced civilization 8,000 to 10,000 B.C. This school of thought has been around for hundreds of years, but new findings give it more credibility. The most popular myth was that “…the Sphinx was the true portal [entrance] of the Great Pyramid” and “The Great Sphinx of Gizeh served as the entrance to the sacred subterranean chambers [of the Great Pyramid] in which the trials of the initiate were to be undergone.” Some claim that sand and rubbish covered a bronze door in the forelegs of the Sphinx that the Magi sprung open. Now various diggings around the Great Pyramid have not verified any of these basic claims about the Sphinx.The consensus about the Sphinx is that some priestly class erected it for some symbolical purpose. It is clear from the granite Stela, inscription by Pharaoh Thutmosis IV of the Fourth Dynasty, that many of previous eras believe that there is something magical about this Sphinx. 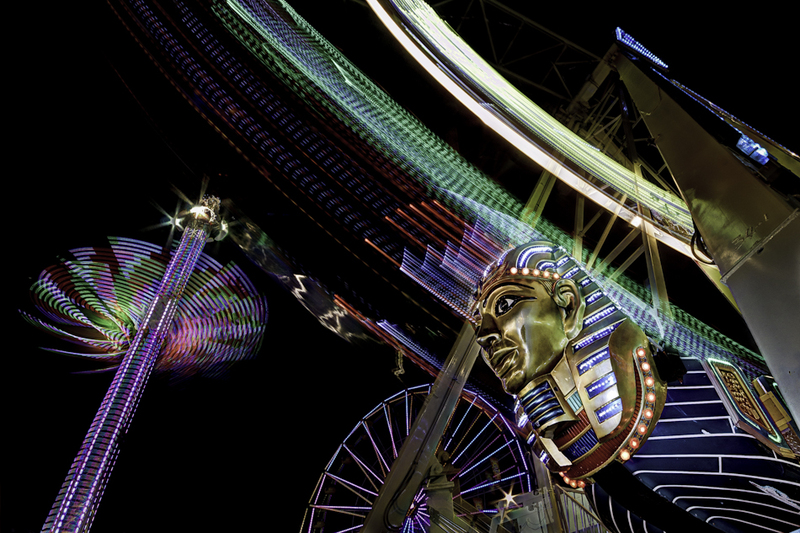 This striking image was shot at The San Diego County Fair as part of a series on night photography, specifically on capturing the excitement and motion of the whirling rides. We will be publishing a “How to” article shortly detailing the Tips and Tricks for night photography – stay tuned, or better yet, subscribe to the blog! Here, this Sphinx ride would rock eager passengers through 180 degrees of motion – we tried to capture this dynamic in this shot…what do you think? The wondrous displays of color that define the world around us are manifestations of light and, as such, each possesses a unique frequency. The attraction we feel to certain colors is not a matter of pure chance. It is easy to overlook the colors that saturate our personal and professional environments. Yet these, whether in the form of the paint on our walls or the clothing we wear, can influence our thoughts, behaviors, and feelings to an extraordinary degree. The colors we like best are often those that we need most in our lives, and there are many ways we can utilize them. Basking under a colored lightbulb or gazing at an area of color can stimulate or calm us depending on the color we choose. For example, red stimulates the brain, circulatory systems, giving us an energy boost, while blue acts to soothe the body and mind. Human beings evolved to delight in vivid sunsets and rainbows, to enjoy the sensations awakened by particularly eye-catching color, and to decorate our spaces and ourselves with bright colors. In essence, we evolved to love the light because of its harmonizing influence on every aspect of the self. 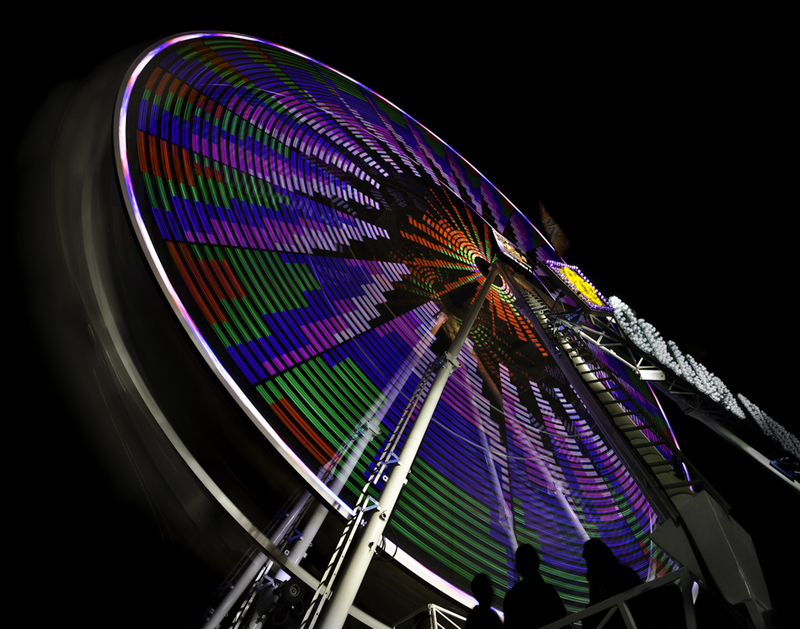 Shooting Tips: This is a picture taken at the Del Mar Fairgrounds of their amazing Ferris Wheel in motion. We mounted our trusty Nikon D7000 on a tripod and equipped it with a 10-20mm Sigma wide-angle lens. Finding a good vantage point was somewhat challenging – it had to be out of traffic and still capture the immensity of the spinning wheel. You can gauge the size by some of the people on the foreground. Setting the camera to Manual Mode, the aperture was adjusted to f13 and then the shutter speed was varied depending on the speed of the wheel and the effect we were trying to achieve, in this case it was 1 second. The camera ISO was set to 100 for minimum “grain” and White Balance set to Auto (primarily due to the various temperatures of the lights all around) and as always, camera RAW (or NEFF for Nikon shooters) was used so that small non-destructive adjustments could be made later. 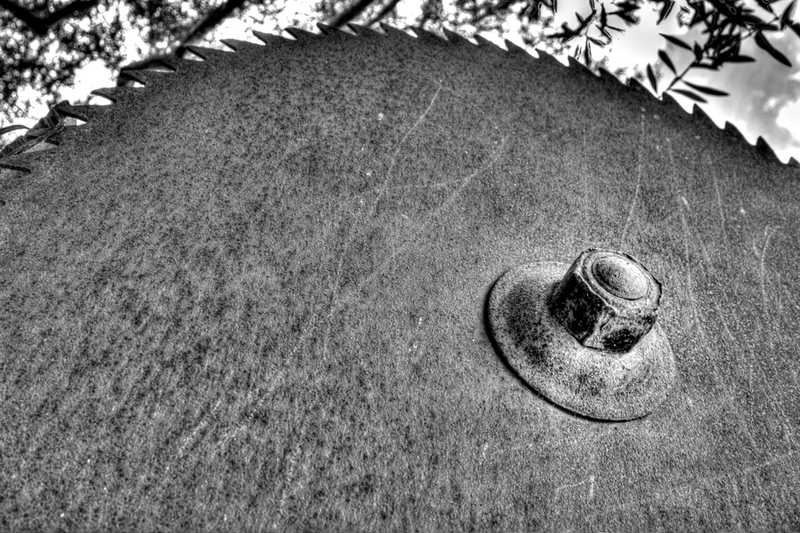 To avoid camera shake during the 1 second exposure, a wired remote shutter release was used – this way you don’t have to physically depress the shutter (and cause the camera to move resulting in a blurred or even jerky image). Much of these types of shots are the result of experimentation since there are so many variables of light and motion tempered with a bit of experience. It is a good idea to preview the images as they are shot, look at your Histogram to ensure that highlights are not overexposed and make adjustments on the fly…and of course, have fun! The idea that our best isn’t good enough…how often do you hear that and how much sense does it really make? Your best is always good enough, because it comes from you, and you are always good enough provided you are giving your best. You may not be able to deliver someone else’s idea of the best, but the good news is that’s not your burden. You only need to fulfill your own best potential, and as long as you remain true to that calling, and always do your best to fulfill your purpose, you don’t need to expect anything more from yourself. It’s easy to get tangled up with the idea of trying to be the best—the best parent, the best employee, the best child, or best friend. If we try to be the best, we run the risk of short-circuiting our originality because we are striving to fit into someone else’s vision of success. On another note, there is nothing wrong with wanting to improve, but examining where this feeling comes from is important because wanting to be better than others is our ego coming into play. Letting go of the tendency to hold ourselves up to other people’s standards, and letting go of the belief that we need to compete and win, doesn’t mean we don’t believe in doing the best job we can. We always strive to do our best, because when we do we create a life free of regret, knowing we have performed to the best of our ability. This allows us to feel great personal satisfaction in all of our efforts, regardless of how others perceive the outcome. 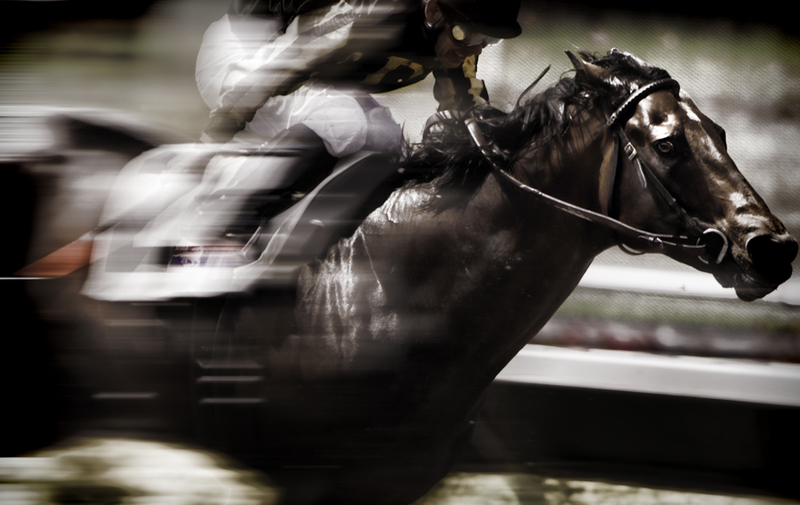 This dramatic image was shot at the Del Mar Racetrack in San Diego, California. While we were not right onto of this horse and jockey, we did have the benefit of using a long telephoto lens, specifically the Nikkor 70-200mm f2.8. We added a 2x doubler and zoomed in even farther. This makes for a heavy and hard to handle combination, so we mounted the Nikon D7000 along with the zoom and doubler on a monopod and found our way close to the finish line (having cool looking gear often helps to convince Security folks that you have some importance). Shooting multiple frames per second and panning the action, or having the focus on the subject and moving the camera and lens to follow, allowed us to capture this action. Panning takes some practice, but is really helpful for any action scene, especially when it is running at 90 degrees to the camera. Having a monopod allows for quick swiveling to follow the action and it is compact as not to disturb others in the area. You might watch photographers at NFL games, they almost all have their massive lenses supported by monopods – they are inexpensive, portable and allow very reasonable stability, even for portrait sessions!